BRYAN EATON/Staff photo. 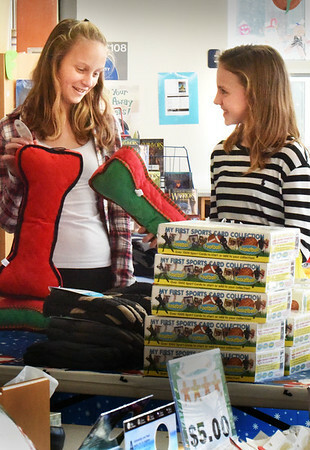 Ava Mullen, left, and Ashley Jones, both 11, check out the items for sale at the Holiday Shop at Salisbury Elementary School on Monday. The event, sponsored by the school's PTA, is not a fundraiser, but affords students the chance to buy gifts for friends and family at affordable prices from goods obtained from local merchants.